Mr. N positively adores lure coursing. It is his favorite thing ever. The dogs chase a plastic bag on a line pulled by a series of pulleys. 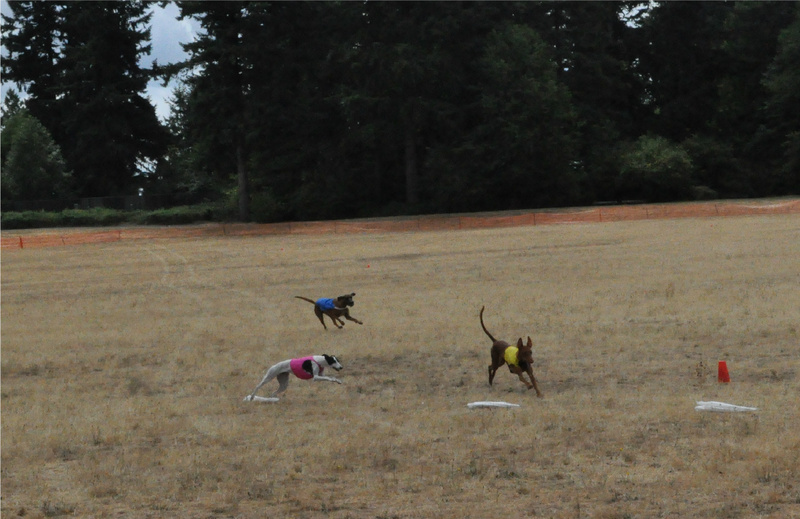 The non-sighthounds run the CAT (coursing agility test). Small dogs (under twelve inches) and brachycephalic dogs run 300 yards and the big dogs run 600 yards. The dogs run individually and in order to pass, the dogs must complete the course in under a minute and half (300 yards) or two minutes (600 yards). People with their hounds at the starting line. I think they were competing for best of breed. The trial we went to had the sight hounds running in the morning and the CAT test in the afternoon. Mr. N is registered as an All-American (the AKC term for mixed breeds) but due to a registration snafu, he was initially listed to run 600 yards. While he probably would have loved it, I switched him to his proper division. He also happened to be the only small dog running that day so he ran first. I was just asking someone if she minded taking photos of him while he ran when I was told Mr. N was up. So there are no pictures of him running. It’s also incredibly difficult to get a good picture of a tiny tan dog running in dry grass so I doubt the photos would have been good anyway. About to cross the finishing line. Obviously, he’s an off-breed for the sport. That’s the purpose of the CAT. But I guess due to his small and fluffy stature, he’s even more off. He was running the CAT with Belgians, Bouviers, Dobermans, Border Terriers and a Pumi among other dogs. I usually get a couple of quizzical oh…. you’re running him? remarks. Which admittedly is much better than being told I was being cruel to make him run so much (which has happened). This is an instinct test and if your dog doesn’t want to run, they won’t run. This Dalmatian was super excited and dragged his owner to the starting line. But once people see him run, they change their tune. Mr. N gets so excited when he sees lure coursing, he literally quivers. I’m glad that is his preferred reaction rather than screaming at the top of his lungs like some of the other dogs. At his first trial, he was the fastest (and smallest) dog in his division. It’s a pass/fail test and there are no rankings but it’s still pretty cool to know that he is super fast! He runs with great enthusiasm and he never loses sight of the lure. 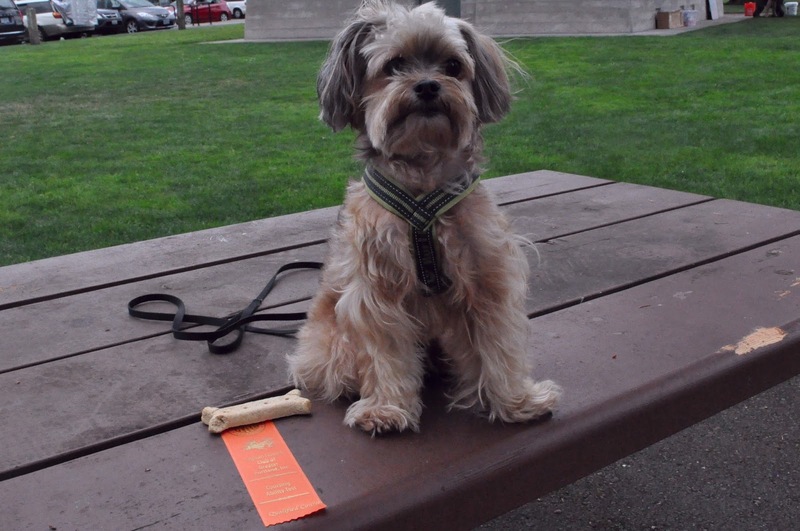 He completed his run in good time (not sure of the exact time, this club doesn’t keep track of time) and won a ribbon. He would like to do it again now please. Mr. N posing with his ribbon and the giant Milkbone that he won. Mr. N wants to go back to the field now. Good for you, Mr. N. I'm not sure I could get Ruby interested in this sport. LOL! Oh my gosh, Haley would love this!! I'm going to have to find a place around here where they do this. I'm glad Mr. N had fun and he definitely can hang with the big dogs! You should! All that running around with Sage has helped his conditioning I think lol. Awesome, Mr. N! I think Ruby would love lure coursing but I'm not sure she could handle all the other dogs. Mr. N totally tunes out the other dogs when he's running/before running but his prey drive trumps getting excited over other dogs. One of the dog parks here does it as a fundraiser (not a trial) and the dogs run individually in a fenced area. Maybe look for something like that? We love that Mr. N surprises everyone. He sure is a big dog in a small package. Don't mess with Mr. N. He's faster than a speeding bullet. I've never seen this in action, but I can imagine it is right up Mr. N's alley (he could probably show the big dogs up!). I bet he'd like to collect a lot of those ribbons! Great job! He has four so far. He'd happily do this every day if he could. He is very intense about it. After he finished, he would watch all the other dogs and track their movements and the bag. Glad they opened it up to the non sight hounds. The other dogs have fun with it too! How fun that he loves it so much! So great that you found out that he loves to do it! Congrats on the ribbon! This looks like such fun! I want to find an event to attend sometime. Don't you just love that attitude that dogs have? He doesn't know (nor does he care) that he's not 'supposed' to love this. They just love what they love. Congratulations Mr. N! Congrats and very cool that he loves lure coursing.